This month’s choreography series is plank…with gliders. We decided to put the hardest move and the most punishing prop together in one. Sometimes we are evil. Target: Torso, abdominals, and obliques. But since this is plank, just know that every other muscles in your body will be working as well. 1. Start in straight arm plank with a glider underneath each foot. Shoulders are over wrists, scaulae flat, spine is neutral, legs hip distance apart. 2. Bend at the knees and slide feet forward towards the wrists. Stop knees directly under the hips, spine remains neutral, hips remain at the same height. Repeat the set (steps 1 and 2) eight times on a double count (slow) and eight times on a single count (fast). Finish set 1 in the straight arm plank – no breaks! 1. 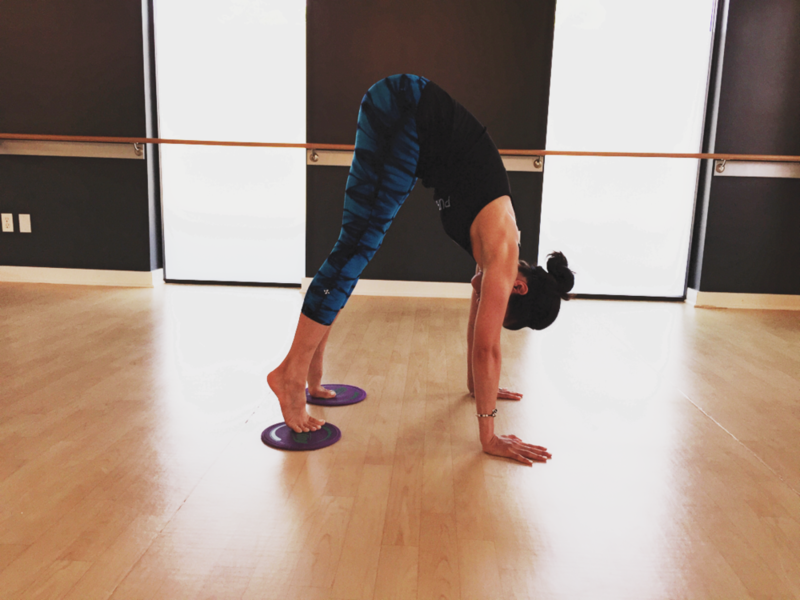 Keep the legs straight, lift hips up, and slide feet towards wrists. Keep the shoulders over the wrist, gaze to the thighs, pelvic floor pulled up, waist cinching. 2. Slide back to straight arm plank. Extending the hips, squeezing the glutes and the back of the legs, shoulders stay still, control the slide down. Repeat the set (steps 1 and 2) eight times on a double count (slow) and eight times on a single count (fast). 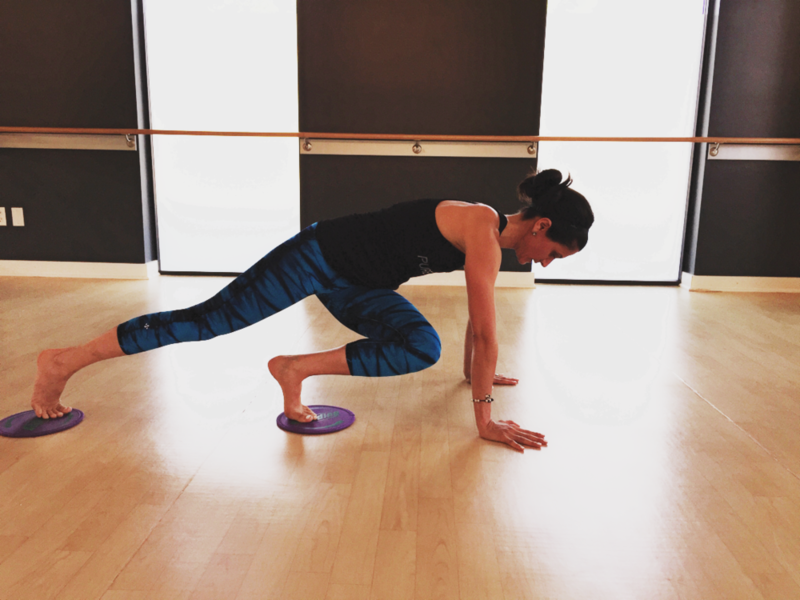 Finish set 2 in your straight arm plank – absolutely no breaks! 1 & 2. Bend the left knee and pull forward towards the right elbow. Step left arm in to center of the chest, lift right arm up and rotate torso side, and extend left leg forward. This is a transition. Yes, we like to work through our transitions. 3. Sweeps bottom leg (left leg) straight back towards the top leg (right leg). Hips remain lifted and at the same height through the movement, use the inner thighs and hamstrings to pull the leg back, rotate top hip and shoulder forward slightly to remain stacked (top hip/shoulder over bottom hip/shoulder). Watch out left obliques. If you’re not on fire you will be soon! 4. Sweeps botom leg (left leg) forward in line with the hip. Hips remain lifted and at the same height through the movement, use quads and hip flexors to slide the leg front, rotate top hip and shoulder forward slightly to remain stacked (top hip/shoulder over bottom hip/shoulder). We told you obliques would be on fire! Repeat the set (steps 3 and 4) eight times on a single count. This is where we end but you didn’t think we forgot about the other side did you? Reverse the transition to come back to double arm plank and repeat set 3 on the opposite side. No breaking people. Really though, encourage your clients to remain strong but also have them be mindful of their own bodies; sometimes breaks might be needed in order to make it through. If the wrists fatigue before the muscles, try a forearm plank modification for steps 2 and/or 3.